About Us | CMB Film Services, Inc.
CMB Film Services, Inc. has been providing the Philippine film and television industry with avant-garde lighting and camera equipment that propels local production to international standards. Over the 25 years of being in the business, it has provided its services to filmmakers, television networks, and movie production outfits. Their top class equipment and highly trained manpower have been witnesses to how the movie and television industry have evolved through the years. 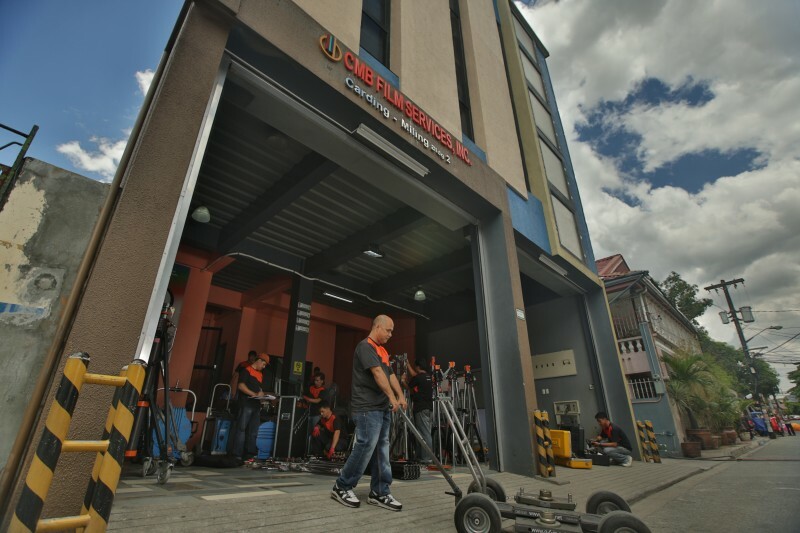 CMB Film Services, Inc. started in 1986 as a small film and commercial equipment rental company at the Baltazar household in East Riverside in Frisco, Quezon City. The late family patriarch who is a multi-awarded cinematographer, Dengcar Baltazar, founded the company with the help of his wife, Miling Baltazar. Years after his demise, his son, Jim, took the helm in managing the company and started expanding the business by building up its equipment inventory and developing its freelance crew for both the lighting and camera department. To date, CMB has 60 employees and 400+ freelance crew. The company is one of the leading equipment rental & technical services that caters to major TV networks, film companies, and TV commercial production houses including foreign film and TV producers. CMB is a major supplier of the entertainment production projects (teleserye) of GMA Network. Other broadcast network clients include ABS-CBN and TV5. Movie production outfits it has served are VIVA Films, Regal Films, Reality Films and Quantum Films. The major commercial production houses it has been servicing are Unitel Productions, Straightshooters, Abracadabra, Filmex, Provill, 88 Storey among others. In terms of capacity, CMB has the ability to serve at least 300 shooting units per month. As part of its social responsibility, it has given all-out support for the development of up and coming cinematographers by partnering with Mowelfund in its training program. For more than 30 years, CMB has never compromised the quality of its equipment offering. It has grown its camera inventory to 37 units that include ARRI Amira and Alexa family (mini, plus, and XT), Red Dragon and Epic, Panasonic Varicam 4K, Canon C500, Sony PMW F3, and the high speed cameras Weisscam HS2 and the latest Phantom Flex 4K of Vision Research. The PL mount lenses, from sets of fixed focal lengths, telephoto, macro and zoom lenses, include those from ARRI, Cooke, Angenieux, Canon, and Leica. Lights, grips, stands and dollies are a variety of equipment from Arri, Matthews, Manfrotto, Movietech, Kinoflo, K6500, Mole Richardson, Dedolight, and Litepanel. Cranes include panther, foxy, galaxy, jimijib, and the only one in Southeast Asia which is the Super Technocrane30. The equipment is complemented by a motorpool of truck-mounted generator sets and grip truck. As it embarks on its next decade, CMB is set to establish its presence in Southern Philippines. It will be bringing in its equipment and trained personnel in Cebu City this August 2015. Production clients are now encouraged to shoot in the Visayas and Mindanao regions. CMB Cebu will surely lessen the logistics and costs challenge of Manila-based production outfits who have eyed regularly shooting in the South for a long time. To complement with its services, CMB has a sister company, Shoot Digital Video Company which was established in 2000 as a Technical Outside Broadcast supplier. It provides OB vans equipped with equipment for VTR, video production, camera control and audio mixing. In 2014, CMB also partnered with Shooting Gallery Studios (http://www.shootingallerystudios.com/) that can provide two shooting studios with an area of 500-600 sqm together with talent lounges, makeup rooms, crew mess hall and kitchen for food setups. The two-studio complex is located in the Central Business District of Makati City covering 3,449 sqm.